Nandrolone is a steroid of anabolic and androgenic action. It became known in 1962. Nandrolone is produced by the organism because of prolonged loads, heavy physical exercises, as well as in pregnant women. Nowadays NAN D 200 is in great request of sportsmen. The main positive quality of Nandrolone is the high activity of the action, which does not cause any side reactions. After the Nandrolone enters the human body, it passes into the dihydronandrolone - a weak androgen. This is due to the enzyme 5-alpha-reductase. Such exposure does not cause adverse reactions. The drug has anabolic (150% of testosterone) and androgenic (30% of testosterone) activity. Transition level to estrogens is very small. The drug doesn’t affect liver. It lasts about 15 days, and during doping control will not be found about 1.5 years. ·Improvement of immunity in general. Nandrolone with proper intake, nutrition and training allows you to add about 8 kg per course of the drug individually. The phenomenon of recoil is relatively small, in contrast to other drugs. 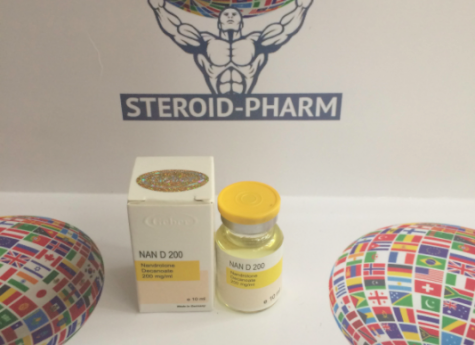 NAN D 200 improves oxygen delivery in body. The anabolic effect of the drug does not come immediately. This ensures the preservation of the effect after the end of the course. The intake of Nandrolone individually lasts a long time. The standard course duration is from 8 to 10 weeks. Athletes can take the drug for about 6 months, while increasing the dosage. Drug injects in the volume from 200 to 600 milligrams once a week, but not more often. You should start taking the drug from a small dosage. Two courses for a beginner are better than one powerful, and also it will help to avoid side effects. In course that lasts more than 8 weeks, you need to add: gonadotropin (at 4-5 weeks, every 3-4 days in a dose of 500 IU); Bromocriptine or Kabergoline (at week 2 and after withdrawal at 2-3 weeks), which will eliminate the effects of progesterone; Clomiphene (recovery of sensitization); Boosters (1 month of reception restores endogenous testosterone). 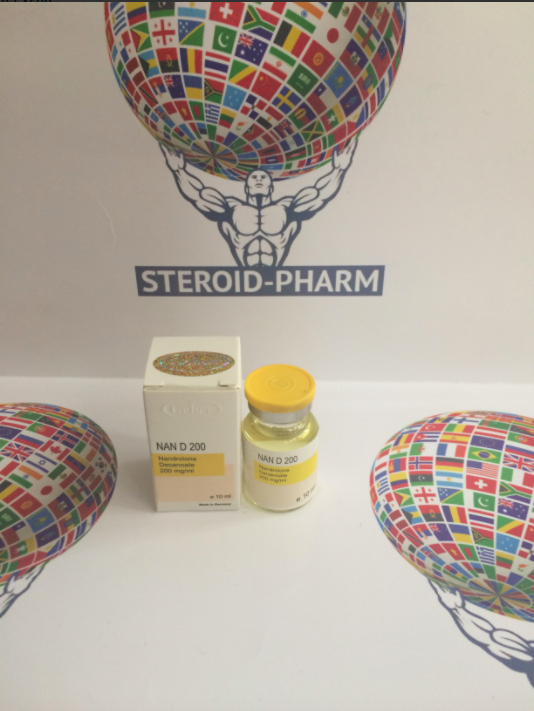 NAN D 200 well combined with Winstrol, Sustanon, Testosterone and Methandrostenolone. In various sports NAN D 200 decanoate has become very popular. Experienced athletes are aware of the effectiveness and quality of the drug. Easy injection tolerance, excellent results and no adverse reactions attract those who use Nandrolone. The use of NAN D 200 by women is significantly less than that of men. However, female athletes also take the drug in small dosages. This steroid does not have adverse reactions and negative effects on the body. Before taking the drug, you need to consult a specialist, follow the instructions and monitor your condition.